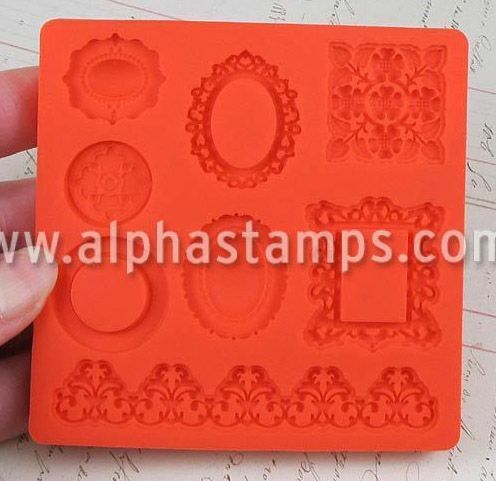 This month’s theme at Alpha Stamps is Cinderella. 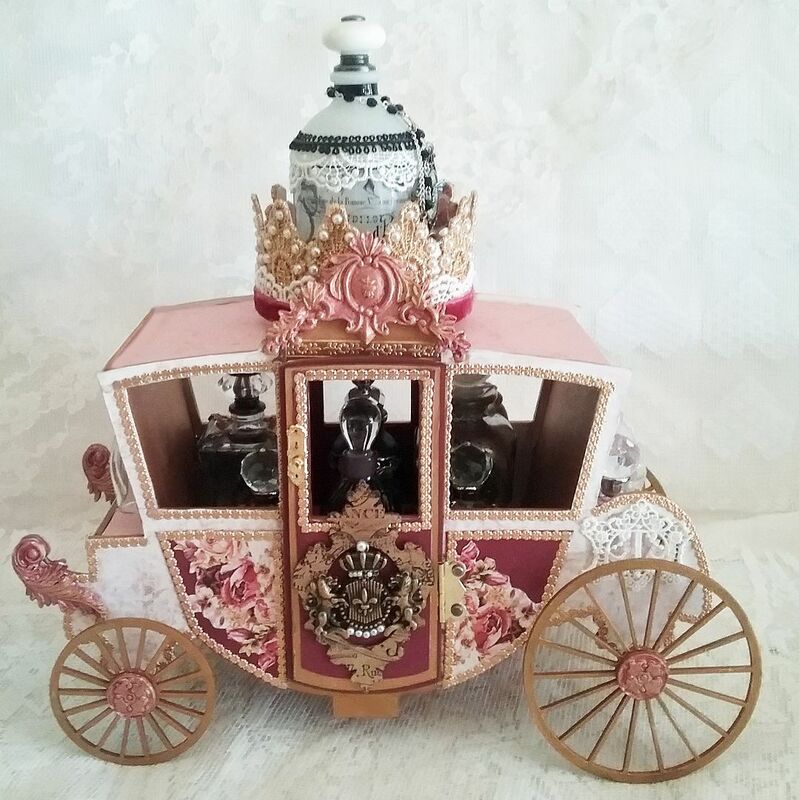 As I’m still on my kick of creating items both beautiful and useful, I decided to decorate a 3D coach fit for a queen that doubles as a bottle caddy. 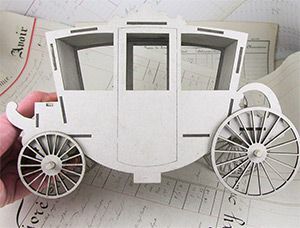 The project is made easy by using the 3D chipboard coach kit pictured above. 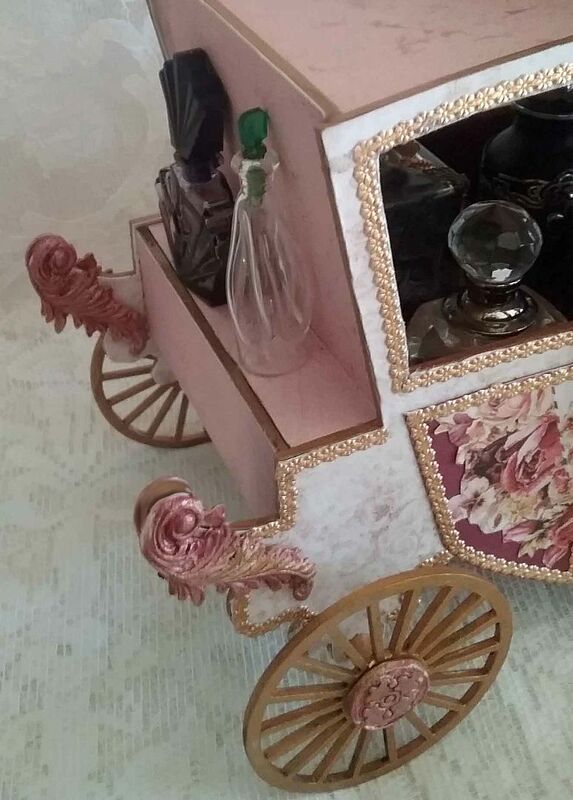 The door opens giving you access to the inside of the coach where I placed 6 perfume/altered bottles. 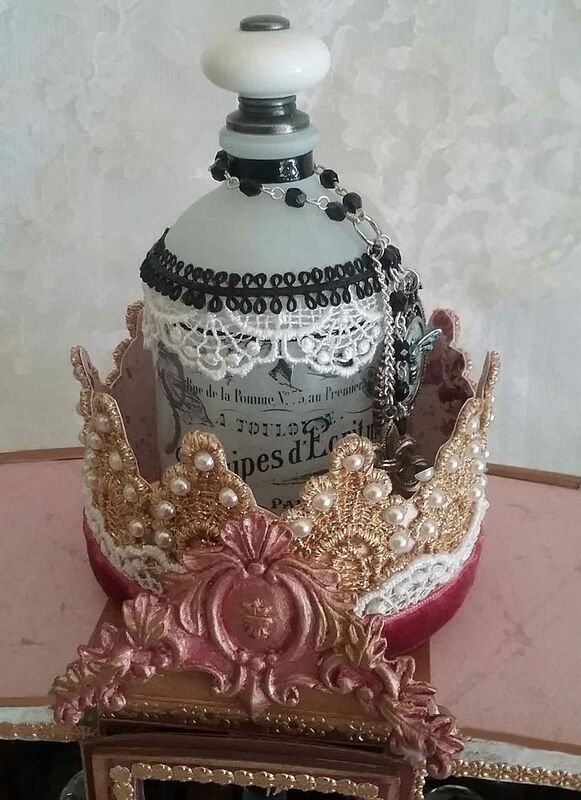 At the top of the coach is a crown made from paper and lace in which I have placed a larger bottle. On the front and back of the coach, there is even more room for small bottles. I started by painting all of the pieces in the coach kit gold. 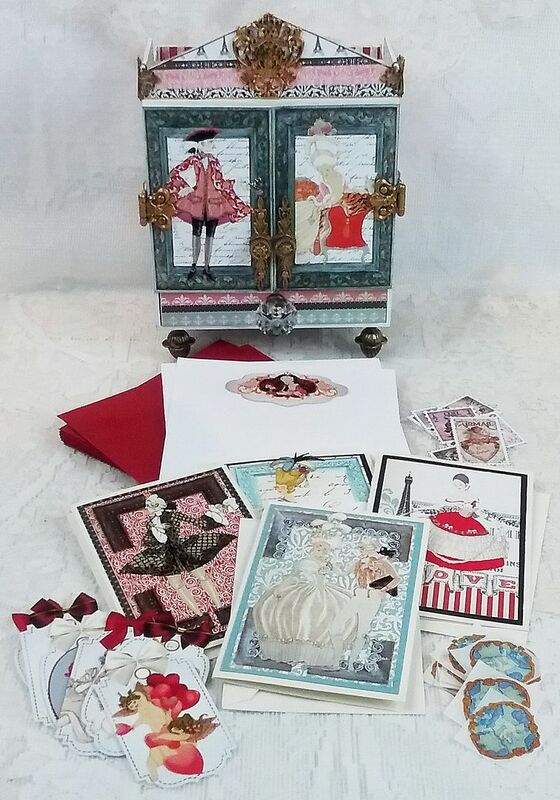 Next, I decorated the side pieces by adding decorative paper, Dresden, cardstock, and images cut from the decorative paper. Only the door on one side of the coach opens. Both sides of the coach are decorated the same. 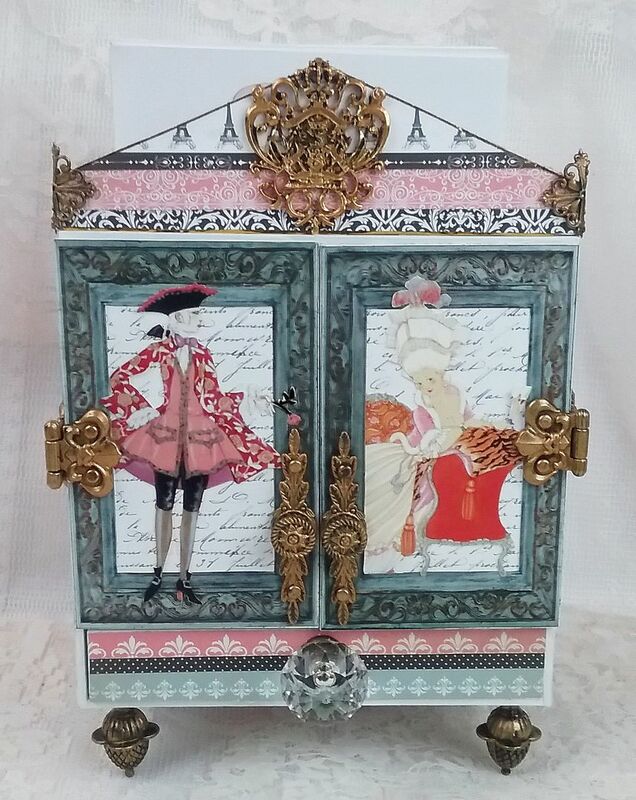 To the door I added a door handle, a chipboard frame painted gold and stamped with a French-themed rubber stamp and a bronze crest decorated with flat-back pearls. To the top, I added a paper clay decorative piece. 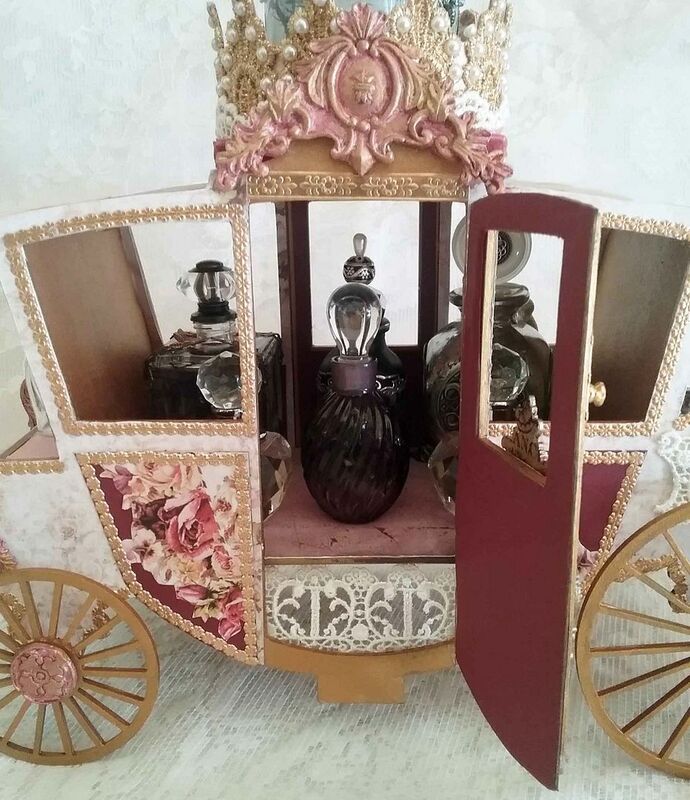 I used paper clay and molds to create the decorative pieces on top of the doors, the flourishes on the front of the coach and the round decorative pieces on the wheels. To the door that comes with the kit, I added a larger chipboard panel so that the door would sit on top of the side of the coach. This is the only door that opens. I glued the hinge between the door and the extra chipboard panel. 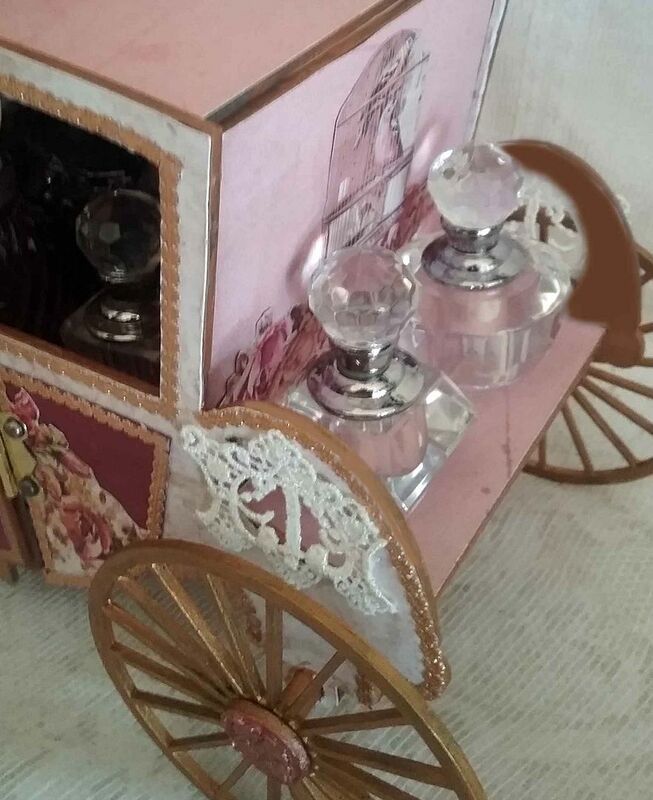 Once the side pieces were finished, I assembled the coach and added decorative paper and images from the paper to the rest of the pieces. 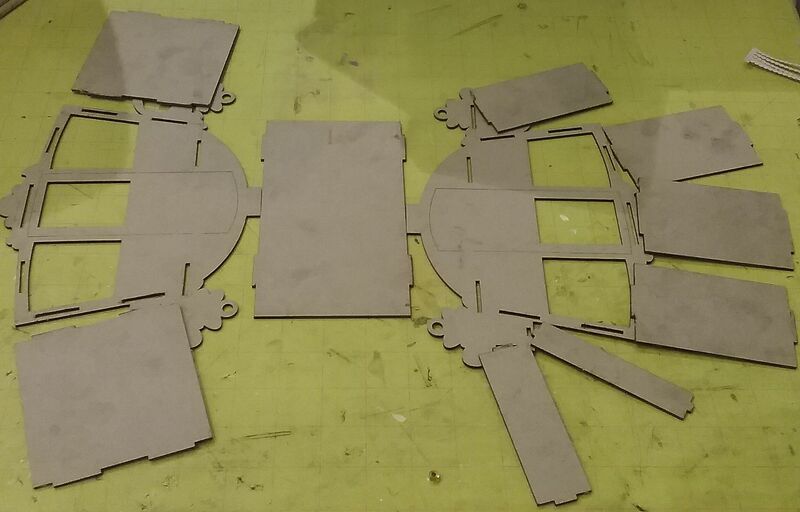 Below is a layout to help you see how the coach pieces fit together. The last thing I did was to add the wheels. I did not paint the dowels that hold the wheels until they were on the coach and the wheels were in place. If you paint them before attaching them they will swell and you might not be able to insert them through the holes in the sides of the coach or through the holes in the wheels. 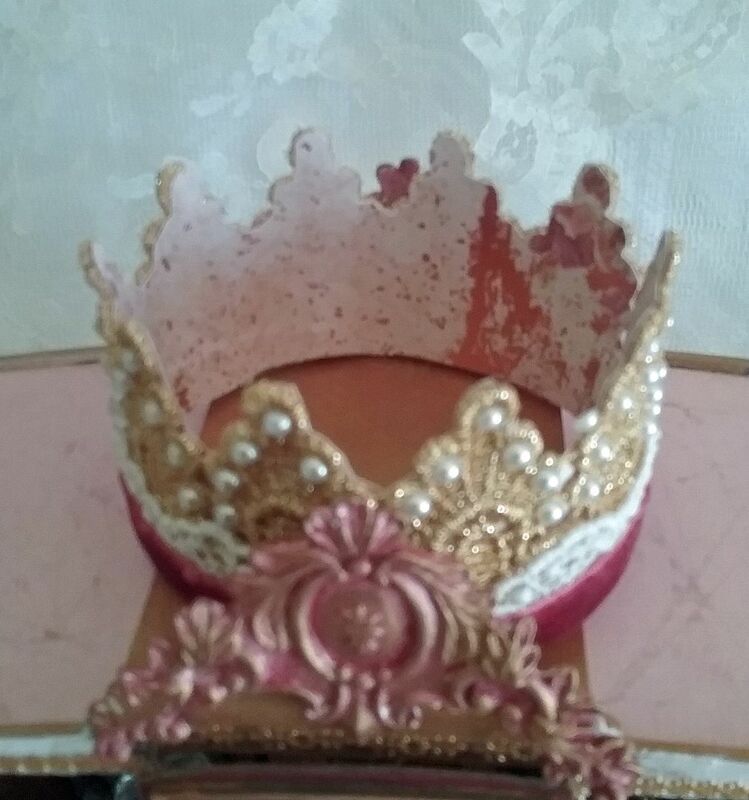 I made the crown by gluing lace to decorative paper. I glued together two pieces of paper for extra support and then applied glue to the lace by running it through a Xyron machine. I cut away the excess paper by following the shape of the lace. I then added more lace, a velvet ribbon and some flat-back pearls. Every once in a while I like to make something that is both lovely and functional. 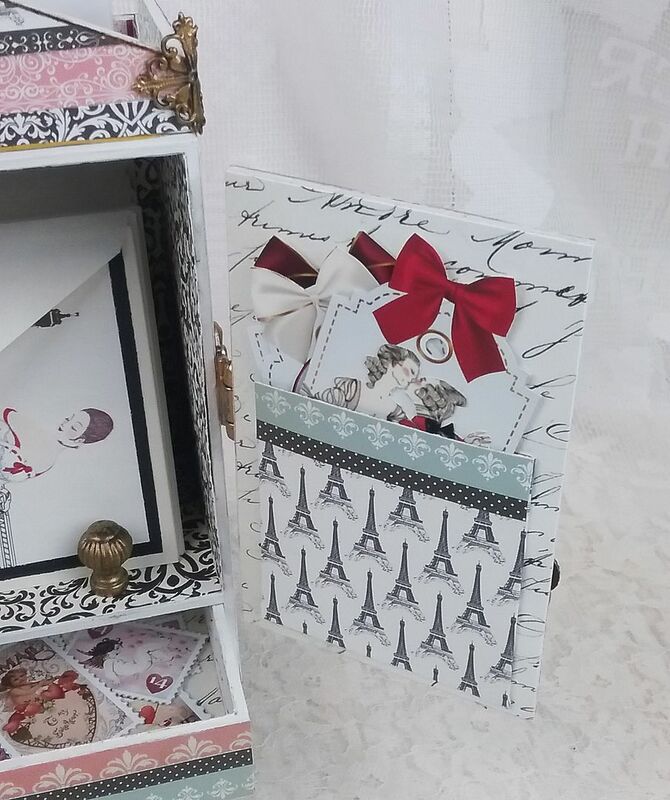 When I saw this House Shrine with Doors kit, I thought it would make a great stationery caddy that you could keep for yourself or gift to a loved one or a special friend. 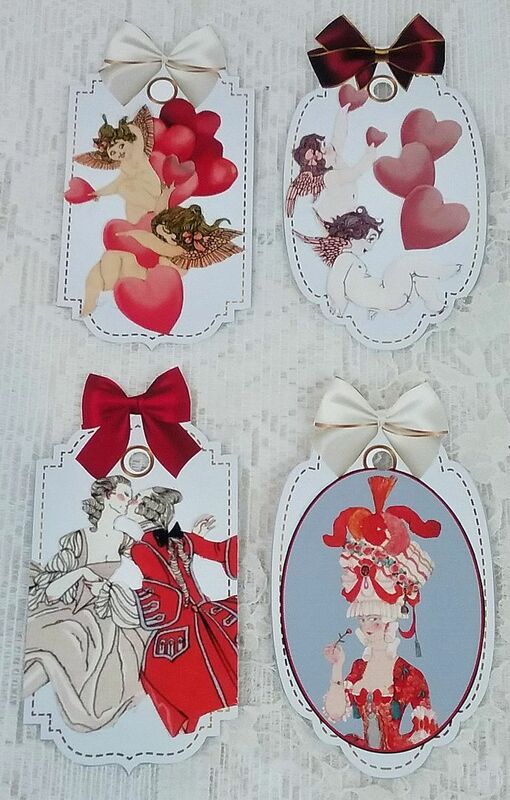 With Valentine's Day right around the corner, I chose to go with a Rococo period romantic theme. 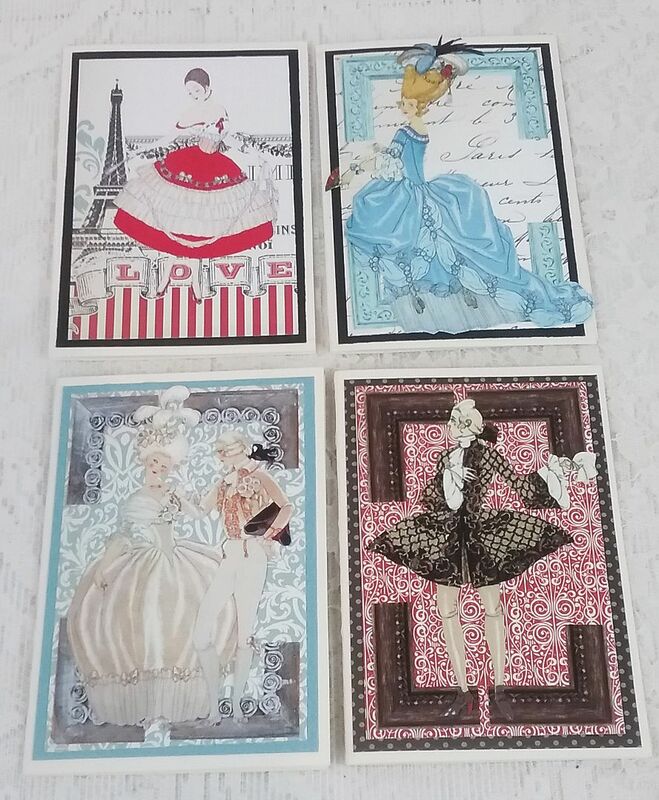 The images I’ve used are from my NEW Amour Collage Sheets. 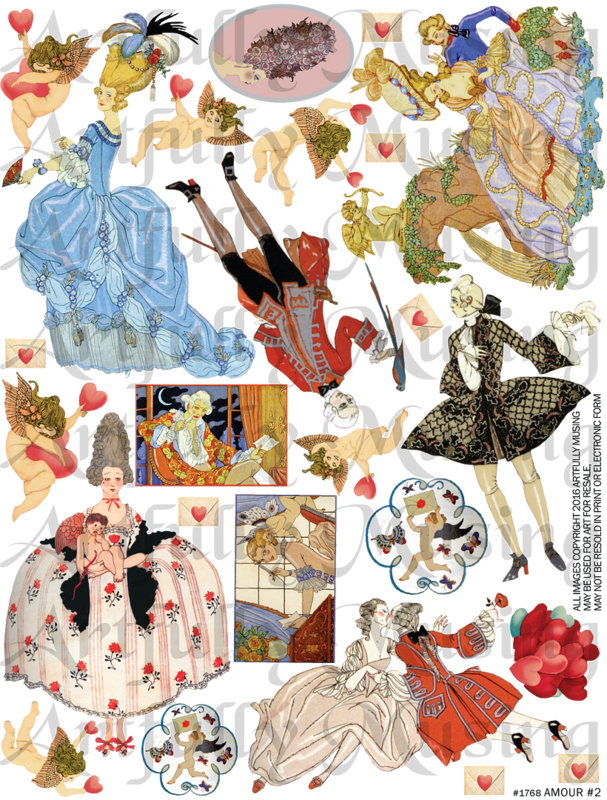 There is also a NEW companion Digital Image Set which contains all of the images from the collage sheets and more. 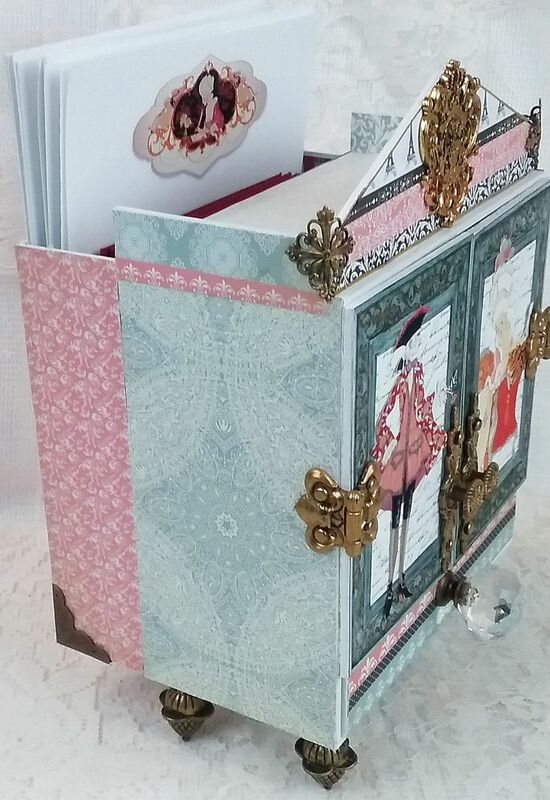 The beautiful papers that so perfectly complement the image's color scheme are from the Amour 6 x 6 Paper Pad and some of the Amour Scrapbook Papers. 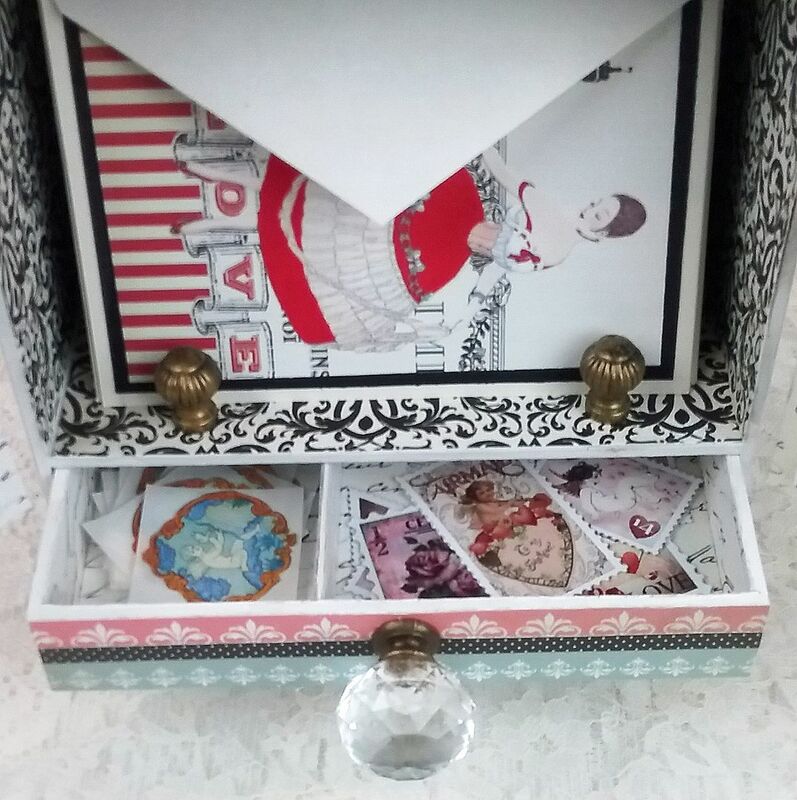 I’ve filled the cabinet with custom paper, envelopes, handmade cards, gift tags, envelope seals, and faux postage stamps. 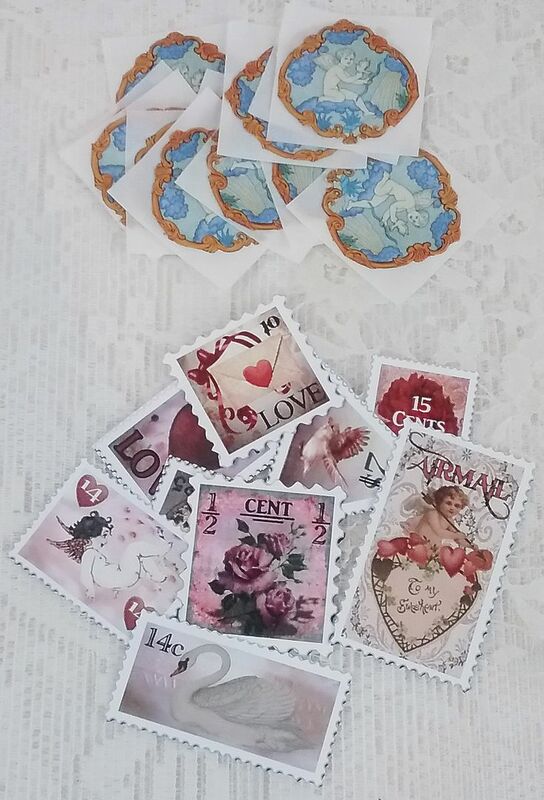 You could also add real postage, address labels and a pretty pen. To expand the storage space, I added a bin to the back and pockets inside the doors. 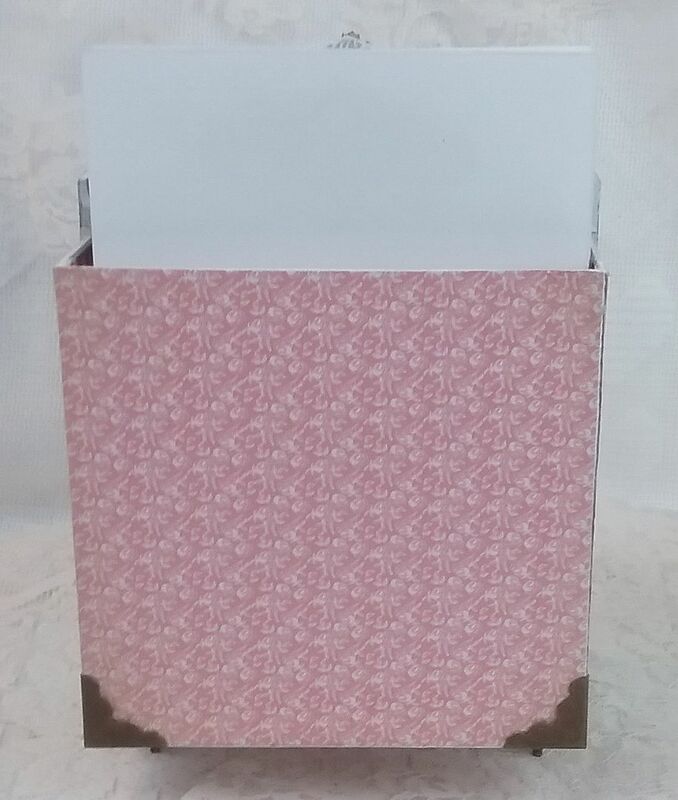 I used the bin to store the custom stationery and envelopes. 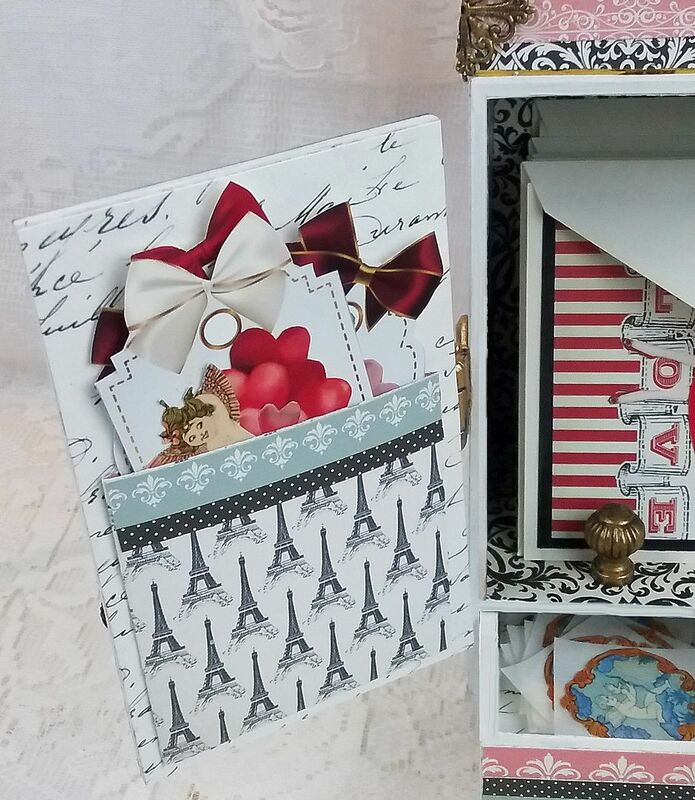 The pockets inside the doors were perfect for storing gift tags. 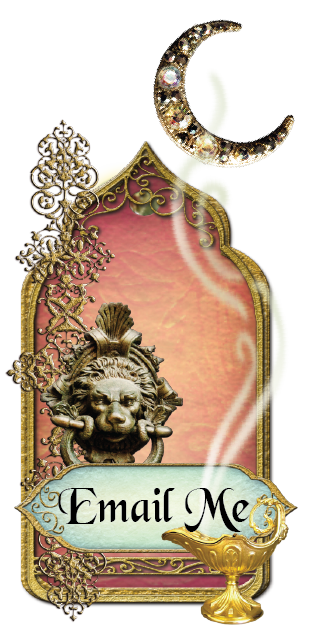 The seals are made using an image from the Amour #1 Collage Sheet. After cutting out the image, I ran it through my Xyron machine to turn it into a sticker. 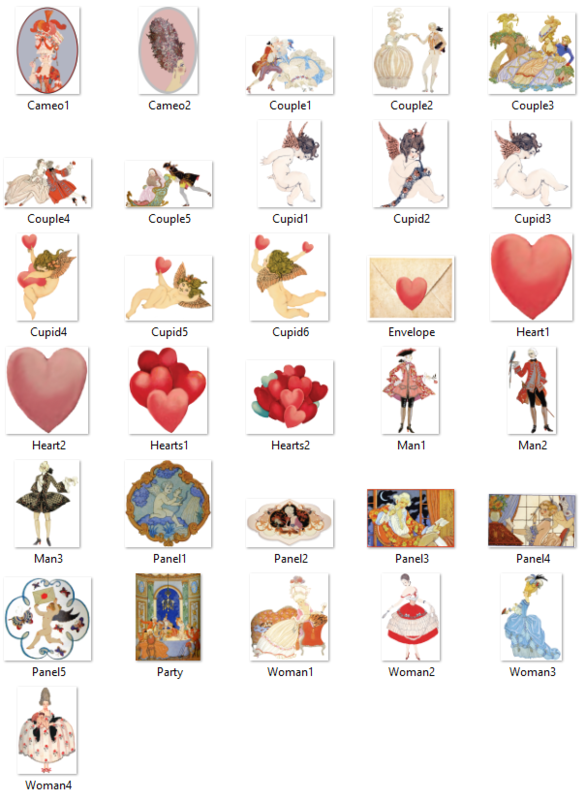 You could also use the hearts on the collage sheet to make additional seals. 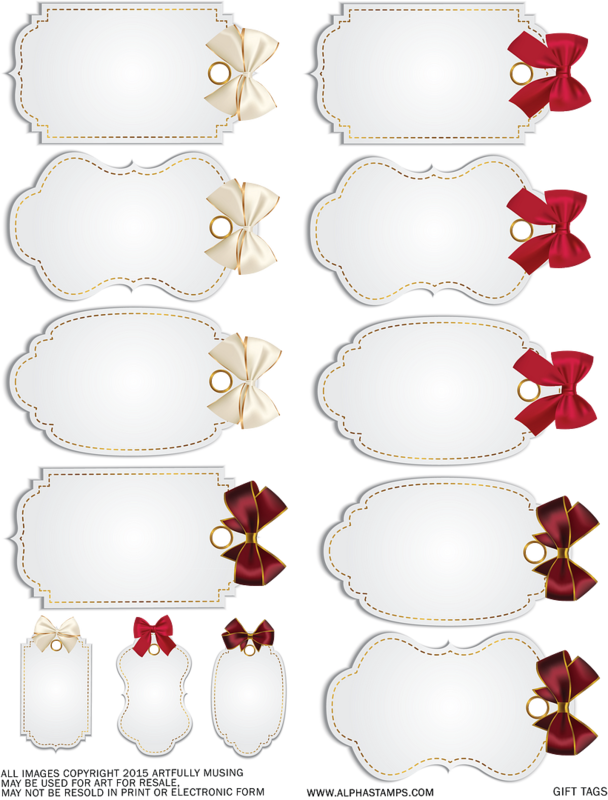 The gift tags are a combination of the new images and the Tag collage sheet. You'll find this FREE SHEET at the bottom of this post. 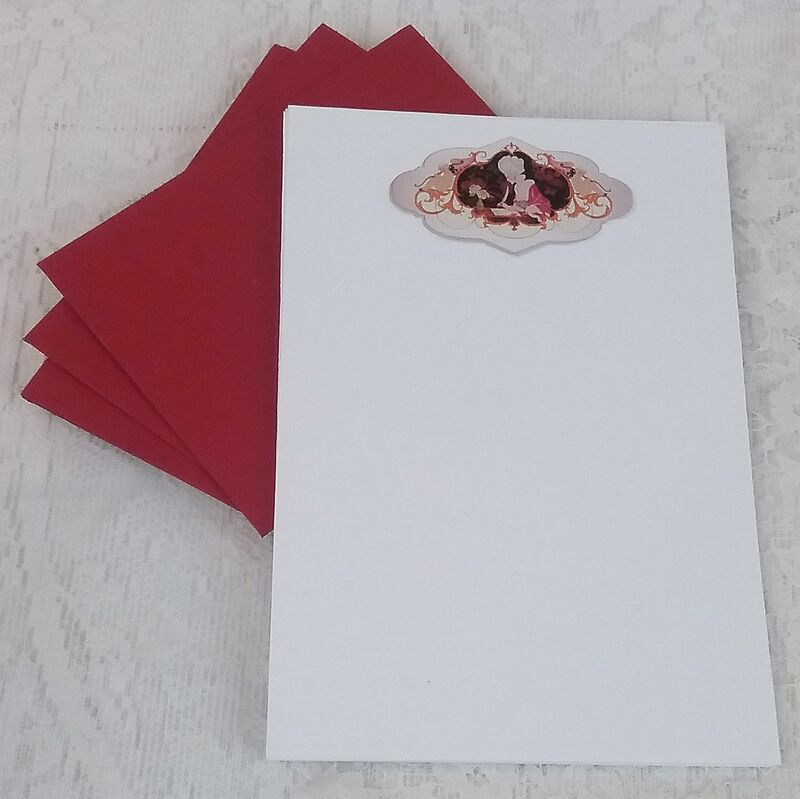 The custom stationery was made by printing one of the panel images from the new sheets onto paper. Another option would be to cut the image out and glue it to the paper. 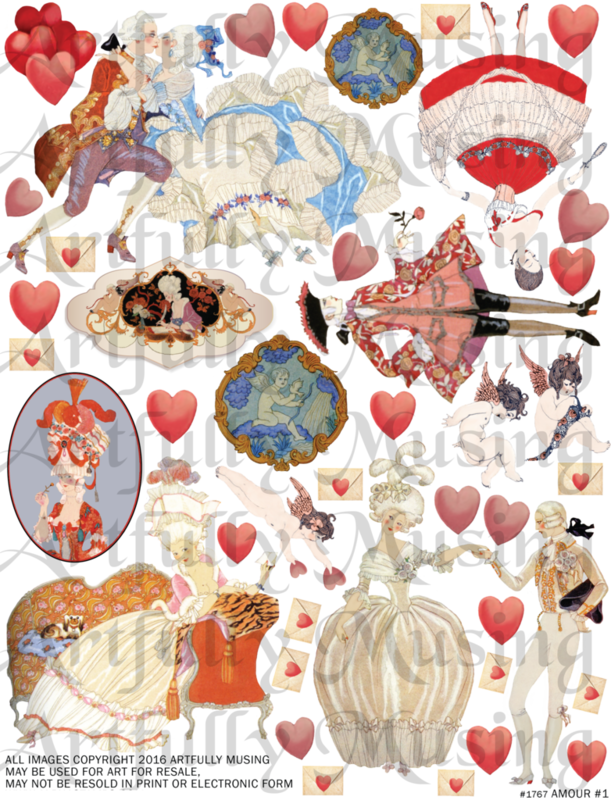 This romantic Rococo period set includes all of the images from the Amour #1 and the Amour #2 collage sheet plus a few extra images. 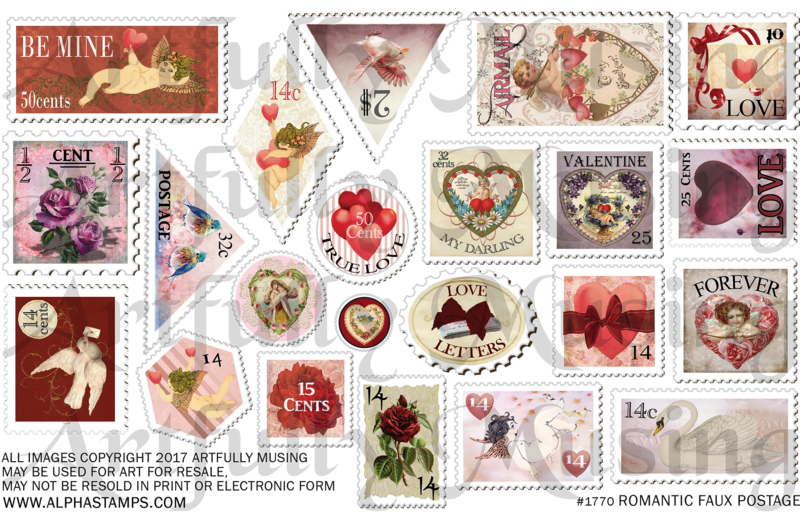 Included are: 2 Cameos, 5 Couples, 4 Women, 3 Men, 6 Cupids, 5 Panels, 4 Hearts, a Party Scene and an envelope for a total of 31 images. 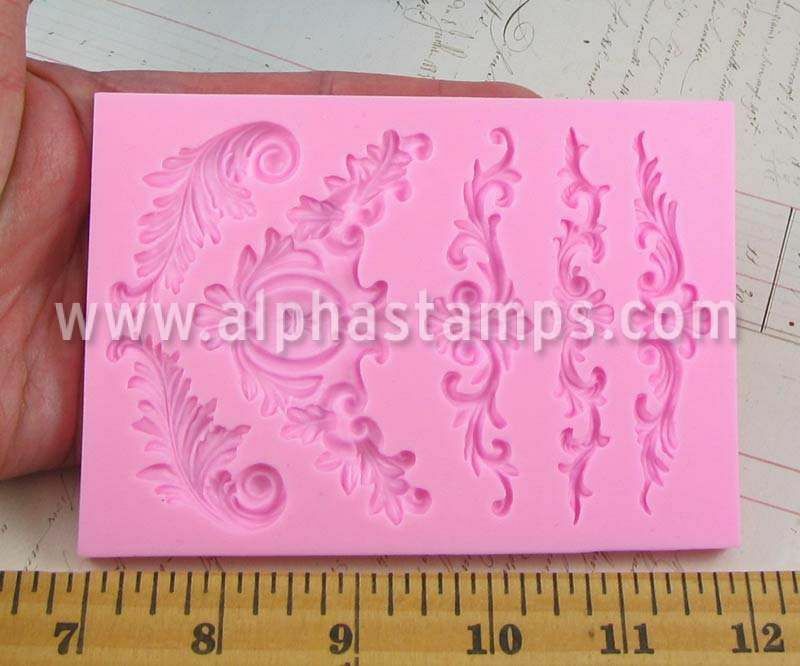 This sheet 23 faux stamps. I started by assembling the main cabinet, pediment, and drawer. I painted all of the edges inside and out white. 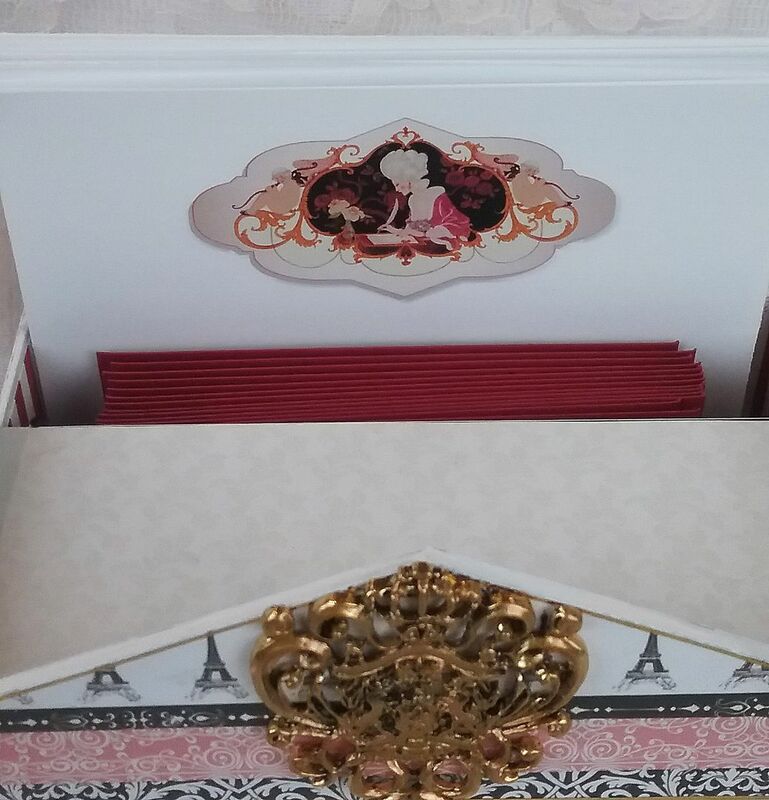 I then covered all of the surfaces with the Amour papers with the exception of the inside of the doors and the inside side panels. I left these areas uncovered until after I added the hinges and handles so that I could hide the prongs on the brads which are used to attach the hardware. 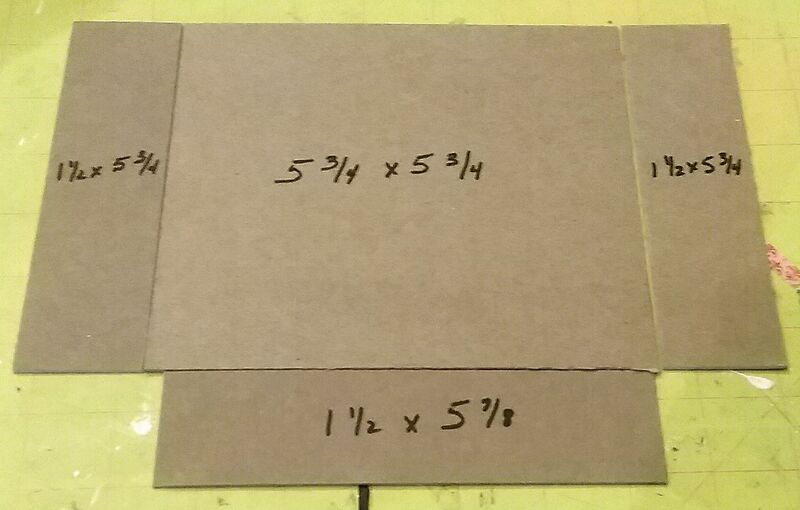 To make the bin that is attached to the back of the cabinet, I cut 4 pieces of heavy chipboard and glued them together. 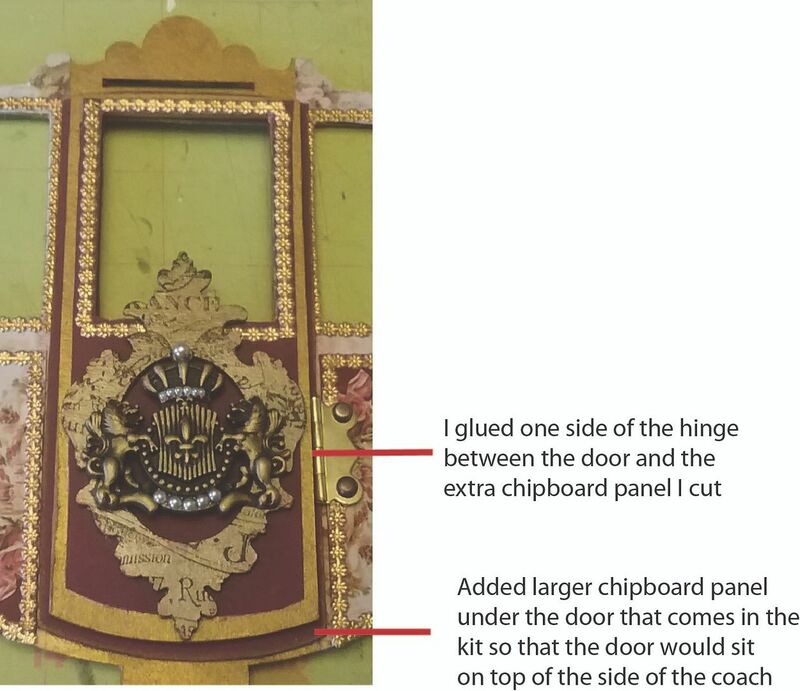 You can see the measurements of each piece in the picture below. The bottom piece is slightly longer as when you attach the side pieces to the back the total width is longer. 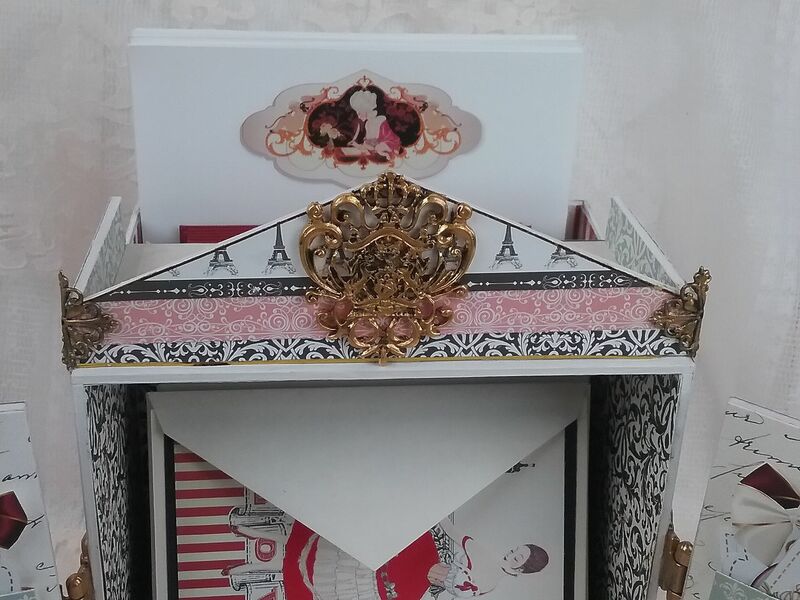 I then covered the bin with paper and attached embossed metal box corners for decoration and support. The bin is then glued to the back of the cabinet using E6000 glue. If you needed more storage space, you could add bins to the sides. 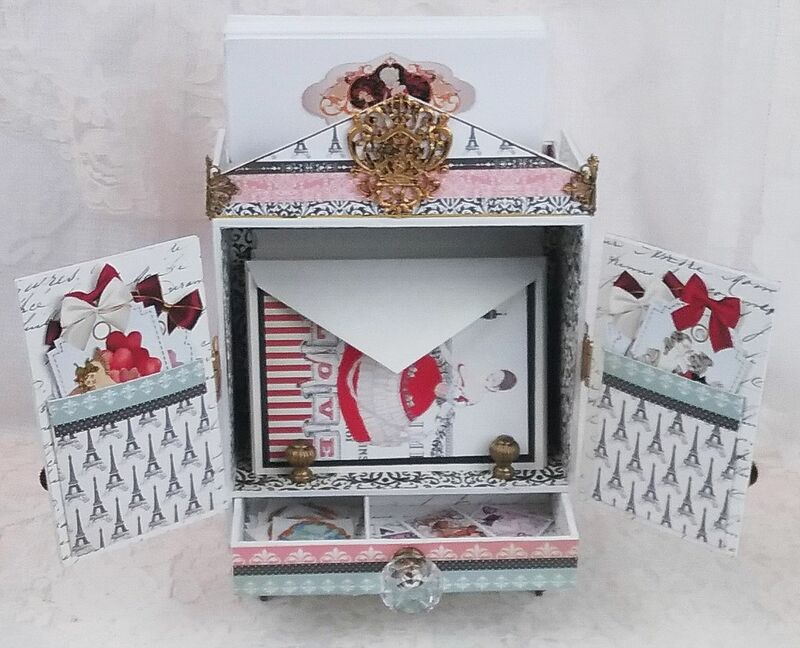 The handmade cards are stored in the main area of the cabinet. 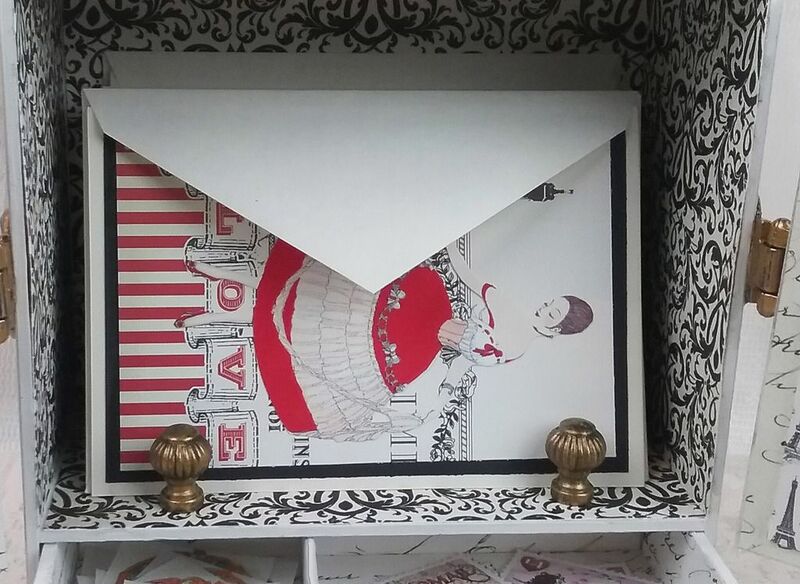 To keep the cards from falling out, I added two metal drawer pulls. 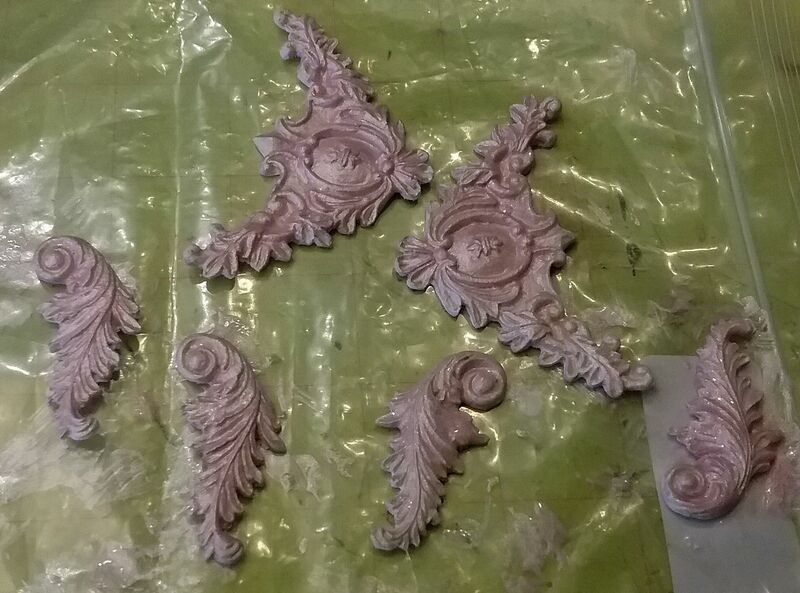 To dress up the pediment, I added a filigree crest and filigree squares which I bent and attached to the corners. I trimmed the edges of the pediment with tiny gold line stripped tape. So that all of the hardware I used in the project would match, I painted it with Metal Patina Paint. The frames around the doors are from my Vintage Frames digital set. I attached the doors using brads which fit through the holes on the hinges. 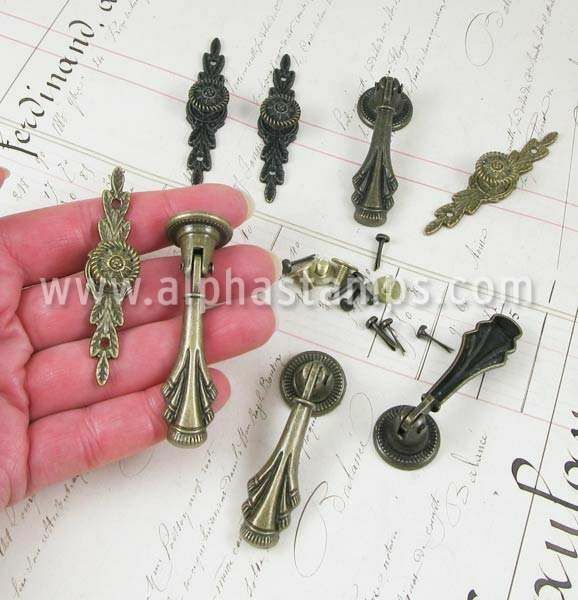 The handles are from the set pictured below. I used some of the Amour paper to create pockets to store the tags. In the picture below you can see how I cut the paper for the pockets. 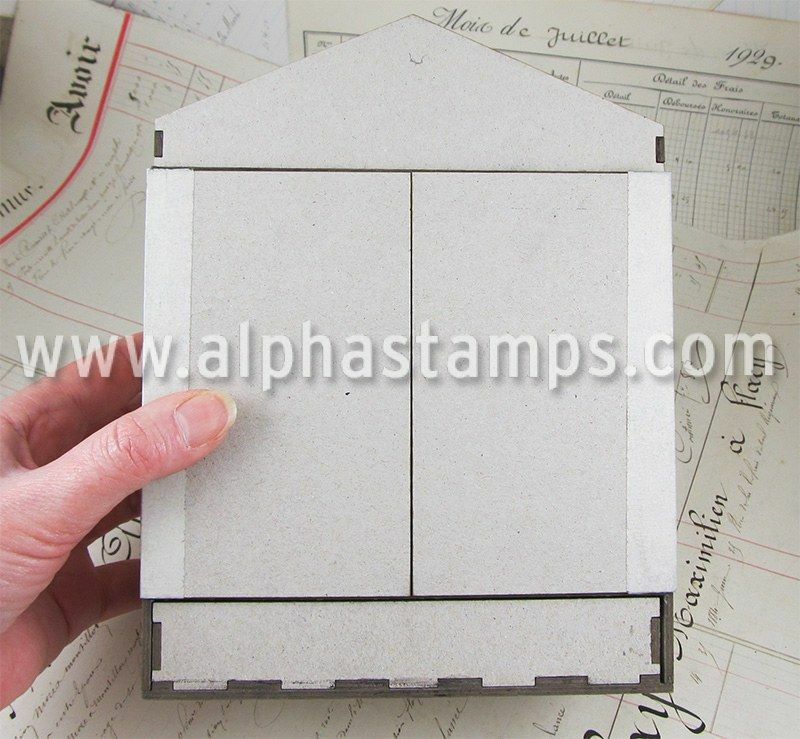 I used a piece of chipboard to divide the drawer into sections for the envelope seals and the faux postage. 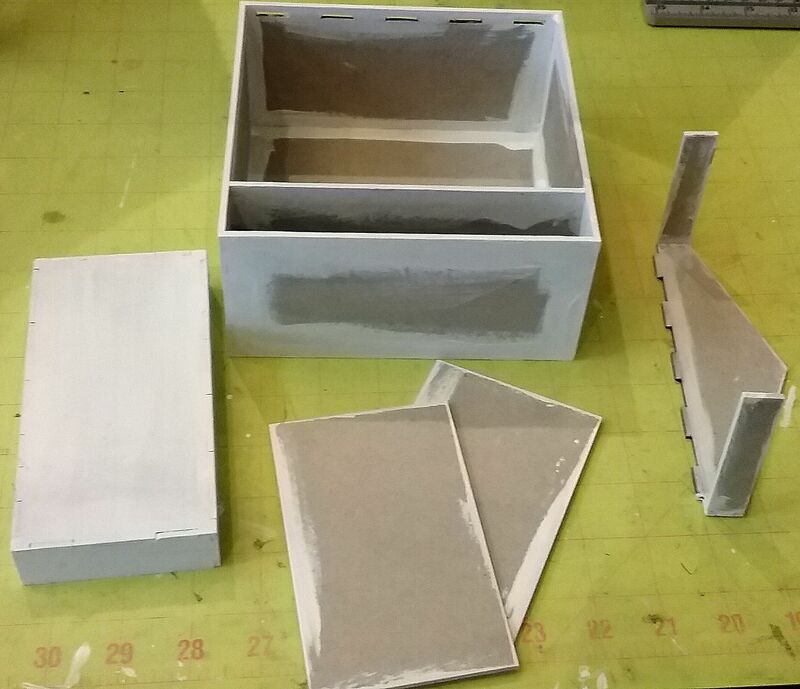 I did not paper the sides, back and bottom of the drawer (I used paint for these areas). TIP: I rubbed Anne Sloan Soft Furniture Wax on the sides and bottom of the drawer to protect the paint when sliding the drawer in and out. 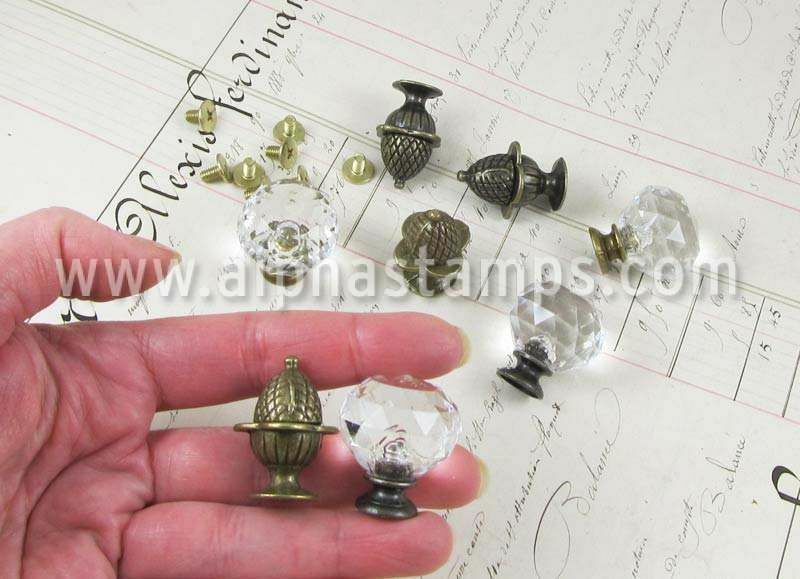 The crystal knob is from a set of antique knobs pictured below. I also used knobs from this set as feet for the cabinet.